Only five days til the weekend!! I am still trying to fight off the cold that wouldn’t die, so I spent a good amount of my weekend staying in and resting. Oh, except for the pitiful BC game on Saturday night. Pitiful, I tell you. 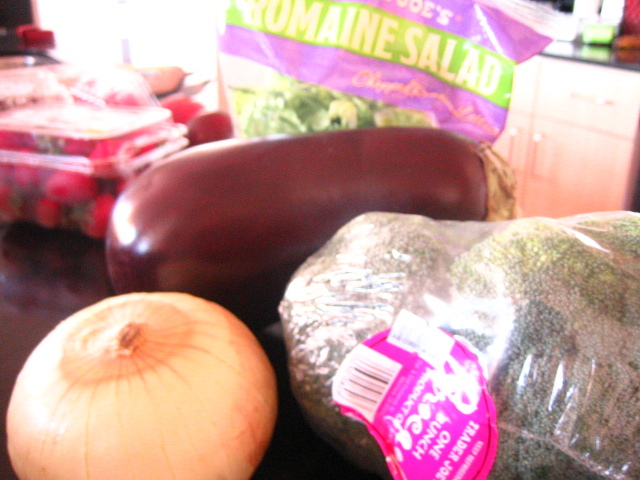 The good news is, since I went to the grocery store on Friday, I had a whole bunch of Trader Joe’s loot to play with! Usually weekends are when I treat myself to meals out, since I love going out to eat as much as I love cooking (really I just love having a plate of food in front of me, let’s be honest), but that wasn’t in store this weekend. So I made my best attempt at take-out from my own kitchen! 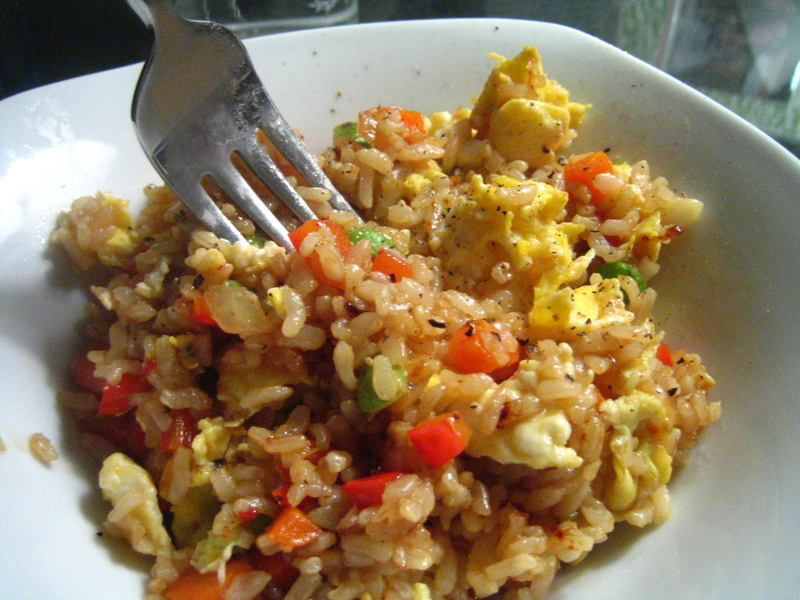 Fried rice is one of those dishes I make when I don’t feel like exerting a lot of effort. If you know the method, you can make it with whatever’s in your fridge. Scramble the egg and set aside. Let the veggies cook until they’re slightly translucent and add rice. 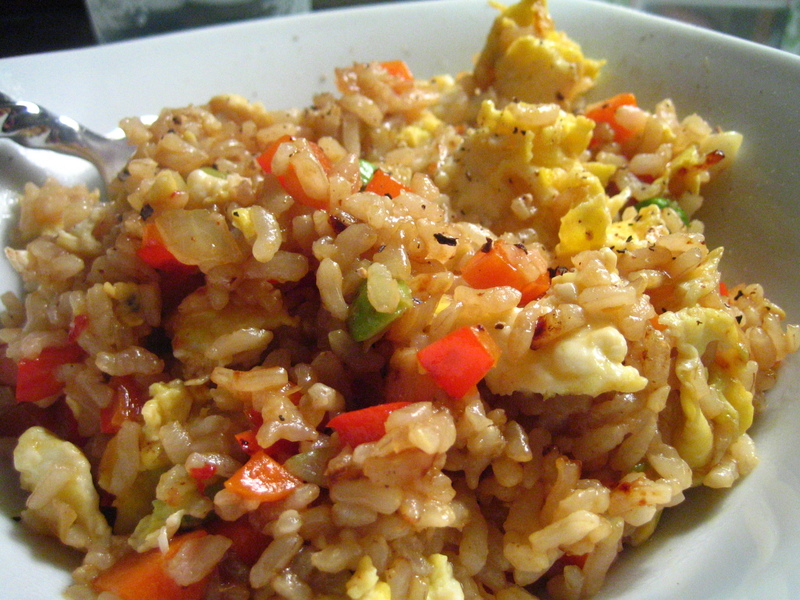 Sautee for a minute and then add a splash of fish sauce and a splash of soy sauce, plus any spices you like. Add the egg back in at the last minute. It’s done when everything is heated through. Not exactly an authentic recipe, but it works for me. 15 minutes from fridge to my stomach? Not bad. Saturday morning I woke up with an intense craving for FlatTop for breakfast. I did not, however, feel like leaving my apartment to get it. This is slightly pathetic considering it is directly across the street from my building, but let’s not dwell on that. 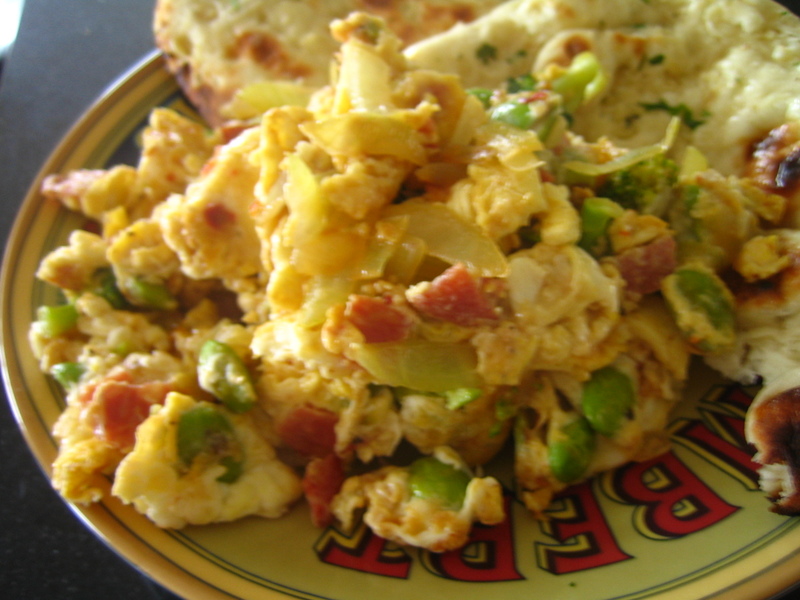 So I improved my usual egg scramble in the comfort of my own kitchen. I added edamame, lightly stir-fried onion, salami, chili paste and broccoli. 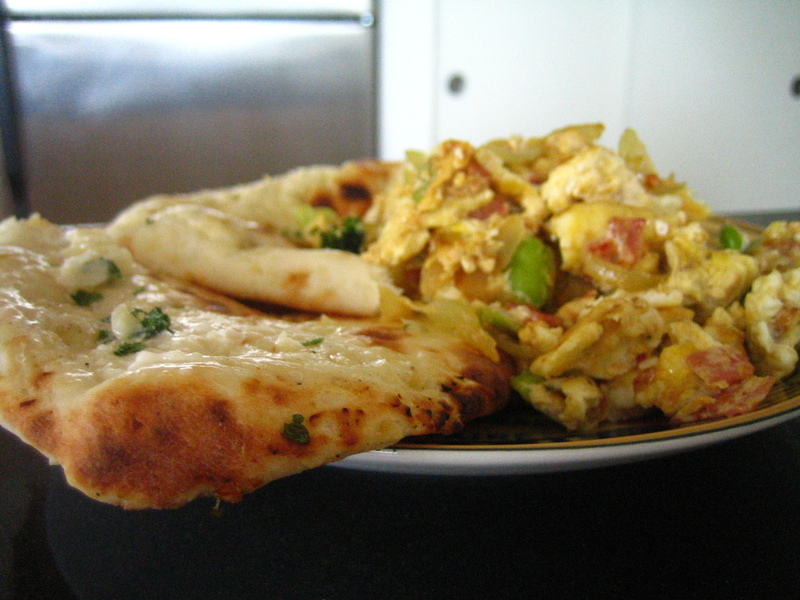 Garlic naan from Trader Joe’s on the side (Caitlin is a fan of it, too). Cheaper than getting the real FlatTop experience, and almost, almost as good! I see three benefits to making your own take-out. 1. It’s cheaper. I don’t care where you order from. Especially when it involves eggs. Eggs are CHEAP! 2. You can control exactly what you put in your food. I love me some oil, but there are limits to how much of it I need. Plus, there are no additives in my cooking. Except maybe some lovin’. 3. You don’t have to worry about dressing up for the delivery guy. What? I don’t do that! What are your favorite take-out inspired dishes to make at home? That’s why I like making my own pizza (on most occasions). Because I can load it up with toppings (some pizza places get so stingy). And you totally win with the lazy Sunday. Never got out of the pj’s? That sounds amazing. I thought I was doing great that I didn’t take my pjs off until 3 pm. NIce one! I used to order pizza and then add on a ton of toppings, until one night it clicked – why order the pizza at all?!? I love making pizza but haven’t done it in ages!